Tile can go just about anywhere. It's not just used on floors anymore. It can be installed on just about any surface in or outside your home. If you have never considered using tile before, you will be amazed by the new colours, and textures available. 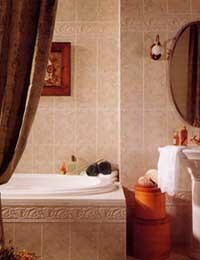 Tile today has become extremely easy to maintain and much more affordable then ever before. Our new warehouse is stocked full of tile at discount prices. We carry only the highest quality materials with the best prices available. Come visit us and we can help you choose the right tile for you and your budget.